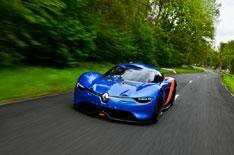 Renault Alpine A 110-50 unveiled | What Car? This is the Renault Alpine A 110-50, a new concept car that marks the 50th anniversary of the Alpine A110 and hints at a possible return of the French sports car brand. Alpine is a Renault-owned brand which produced cars between 1955 and 1995. The A110-50 concept car's design draws on the company's previous models, but has also been strongly influenced by the Renault Dezir concept car that was unveiled in 2010. Renault insiders have previously told us that the next Clio will be influenced by some of the Dezir's design. The A110-50 has carbonfibre bodywork and 'scissor' doors. The 'half-domed' additional lights at the front are a nod to the original A110, while the engine is visible through the rear window. Inside, there's a minimalist dashboard and a steering wheel that incorporates a colour information screen. Senior management figures at Renault have long suggested that the Alpine brand could return - and the A110-50 uses proven technology that could easily be adapted for a low-volume production run. The concept uses the same platform as the Renault Megane Trophy race car and has a mid-mounted 3.5-litre V6 petrol engine that develops 395bhp. Drive is to the rear wheels, through a six-speed gearbox that uses a pedal-operated clutch and paddle shifters. A tie-in with Renaultsport - which has a history of producing high-performance cars in relatively small numbers - would make sense, particularly since the firm's factory in Dieppe is the former home of Alpine itself.